Home How to Play Baccarat to Win For Sure? 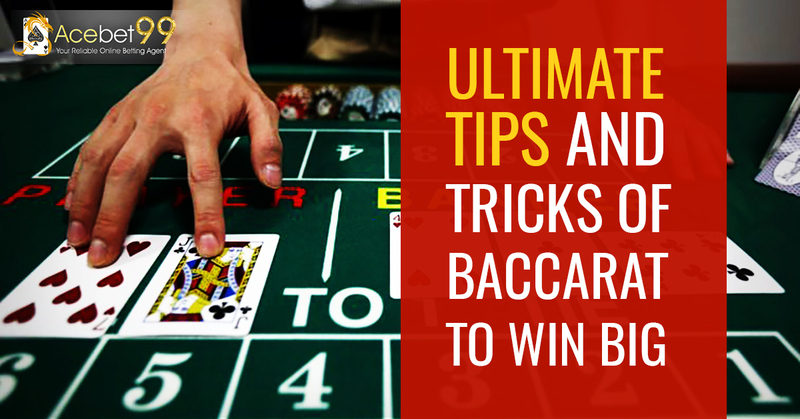 How to Play Baccarat to Win For Sure? Baccarat is one of the oldest casino games. It is considered a royal game, in terms of the people who play it. If you are planning to start playing professional baccarat at online casinos or to improve your game skills, this guide can help you with that. In this article, we will discuss all the basic things like how to play baccarat, what are the rules, are there any strategies to win the game, and some useful tips. Here, Player and Banker do not refer to the actual persons participating in the game, but these are possible bets. A participant can either bet on the banker’s hand or on a tie or on player’s hand. There are two major types of baccarat, Big table baccarat and Mini Baccarat. How to play Big Table Baccarat? As opposed to normal Baccarat games, the Big Table Baccarat is usually played in high-roller areas of the casinos. The stakes are high in these games with each hand starting at $100. Since it is normally played by a high-class audience, the players are well dressed. As the name suggests, the table in this game is quite large, almost as big as the size of a craps table. Each table has three dealers, and up to 12 to 14 persons can play on a table. A player is allowed to bet either on the player or the banker, same as a normal Baccarat game. The dealer button moves around the table, same as the dice goes around on a caps table. A player can pass along the shoe to the next player in case if he/she doesn’t want to distribute. The player who chooses to distribute cannot make a bet. He will continue sharing the cards until the banker loses. The player who makes the biggest bet is given two cards that are hidden face-down under the shoe. The same player can look at the game cards and return them to the player who is distributing the cards. Then, the player shows the cards and a dealer announces the total. If the sum of the two cards is less, the dealer can ask to reveal the third card as well. Finally, the won wagers are divided and the lost wagers are collected by the dealers. What is Mini Baccarat and How is it different? Mini Baccarat is same as the Big Baccarat game, only the table size is smaller and the game is faster. All the cards are turned around on the table. The number of card decks is also different than the big table Baccarat game. Mini Baccarat table is usually found in the normal area of a casino. A player can choose to bet either on a player or on a banker or on a draw. Some tables even allow you to play side bets on the pairs of bankers and players or on other combinations. After all the bets are placed, the dealer hands out two cards each to the player and the banker. The maximum number of points in each hand can be 9. The overall points of each card in the hand are considered to calculate the points per hand. If the total points are higher than 9 in a hand, the player can drop the first digit in order to keep it lower or equal to 9. If either the player or the banker or both have 8 or 9 points, it’s treated as natural, and both hands stand. A third card will then decide the game outcome. If the total in the player hand is 5 or less, it will be given another card or extra points. If the player hand has a total of 6 or 7 points, the banker hand can draw a card up to a total of 5 or less. Depending on the total points in each hand and the third card drawn by the player, the banker decides whether he needs to draw a third card.